This coming Wednesday, Feb. 13, the Yankees’ season unofficially kicks off with pitchers and catchers reporting. For a brief time, it’s tremendously exciting, then barely anything happens until Grapefruit League games start, but given a long winter without baseball, we’ll gladly take it. And barring any surprises, the Yankees’ roster is about done, with, as Mike noted here, there are three spots open: two in the bullpen and one on the bench. I agree with him that Tommy Kahnle and Luis Cessa–both out of options–will get those two bullpen spots for convenience’s sake. That bench spot–the last spot–is the one up for discussion. Let’s take a look at some options. There isn’t necessarily an obvious candidate for this spot, given the way the Yankees already shake out. Their DH–Giancarlo Stanton–is a generally capable outfielder, so playing with him as the de facto fourth outfielder is certainly possible. Additionally, with DJ LeMahieu (apparently) and Gleyber Torres both capable of playing multiple infield positions, and the presence of Troy Tulowitzki, there isn’t a glaring need for an infielder, either. I think, however, we can eliminate two players from consideration almost immediately: Clint Frazier and Greg Bird. This dual elimination may seem ironic, given that they’re better players than the group of NRIs, but both would be wasted in a bench role. Both need to prove health, first of all, and both need to prepare to possibly take over a starting role deeper into the season. Frazier, in his own estimation, is poised to take the starting left field job from Brett Gardner and if all goes right this year, that’s what should happen. Bird, meanwhile, needs to prove he’s worthy of getting his job back after injuries and poor performance gave the first base position to Luke Voit, who took that bull by the horns. For both Frazier and Bird, everyday reps are more useful than playing irregularly from the bench. Others we can eliminate for developmental reasons are Estevan Florial, Kyle Holder, and Trey Amburgey. The former is the team’s top prospect and there’s obviously no way they’ll rush him. Holder, though ready defensively, needs some offensive work in a relatively consequence free environment. Amburgey hasn’t played above AA. Despite a good year at AAA last year–15 homers–I don’t see Mike Ford getting an MLB call up, as he only plays first base. 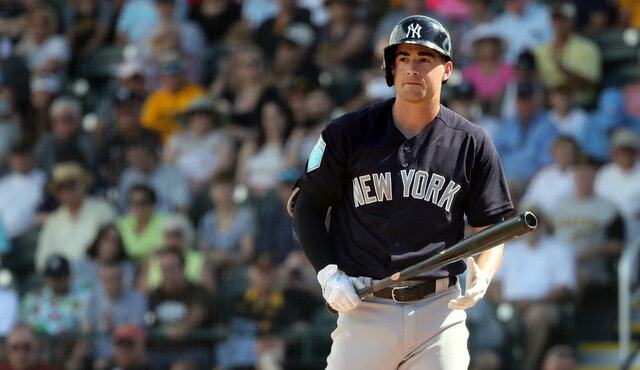 That leaves NRIs Billy Burns, Gio Urshela, and Matt Lipka as the remaining options, as well as 40-man player Tyler Wade, whose presence has been mostly overlooked this whole offseason. Of those four, Tyler Wade makes the most sense. Urshela has the most recent Major League experience of the other three, but can only play third. Burns hasn’t played in the Majors since 2017 and Lipka never has. There isn’t much from either player that suggests they deserve a shot in the bigs, even as bench players. Moreover, all three of those players would require a roster move; are you gonna cut someone for the sake of Gio Urshela, Billy Burns, or Matt Lipka? Absolutely not. Tyler Wade has mostly disappointed at the plate in his Major League time. However, there’s still some room to grow. His defense plays well in the infield and the Yankees have experimented with him in the outfield. He may not be the most position flexible player in the world, but he’s more flexible than the other options the Yankees have and he wouldn’t require a roster move. This may be his last, but Wade should get a shot at the last spot.